check out. 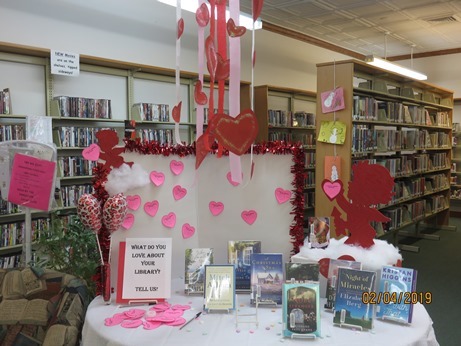 Stop by today to tell us what you love about the library! We still have a few tables available for our Spring Fling. The date is Saturday, April 13th, from 9am to 1pm. Do you make something (crafts, jewelry, etc.) and need a place to sell it? How about at our Spring Fling! Last year we had a wide variety of items for sale, from quilts to walking sticks to fudge to name a few. Price of a table is $25.00. Use the space yourself or split it with a friend. The library will be serving food that day also. Call today to reserve your table, 920-394-3281 and come help us celebrate Spring! State tax forms are available now and we have heard the Federal forms are on the way. If you need a form, stop at any of the Green Lake County libraries to pick one up.